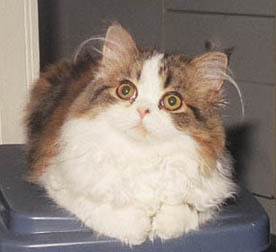 This is a long-haired, brown-patched tabby and white straight-eared girl. She is active and is full of mischief. She is the leader of the group, and thinks that whatever she wants, she should get. 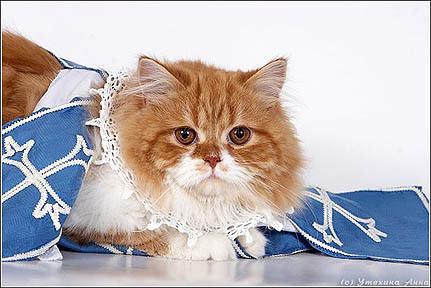 She is now in Russia at Jollycats Cattery. Milady graces the cover of the 2007 KITTENS calendar with photos taken by Keith Kimberlin. McGyv'ear is also featured in this calendar. 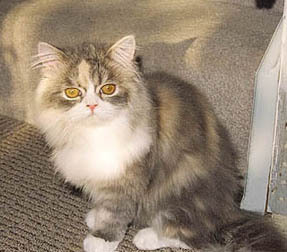 Blueberry is a long-haired, blue-patched tabby and white straight-eared girl. She is a chubby little tyke who loves to play. She also loves to eat! She now makes her home in South Carolina at Amber Snow Cattery. 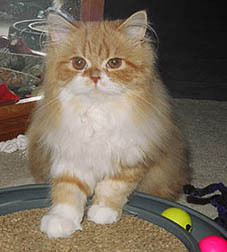 This boy is a long-haired, red classic tabby and white straight-ear. He is a quieter, more laid-back little fellow. He is the largest kitten in the litter. 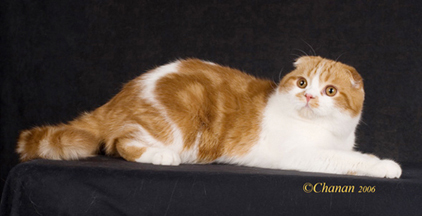 This handsome lad is now in Russia with Olga at Empirecats Cattery. 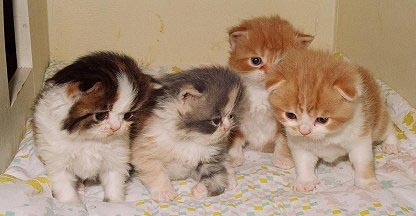 McGyver is the only short-haired kitten in the litter. 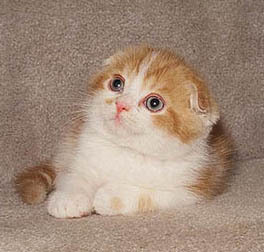 He is also the only folded-ear kitten. And, he is the clown of the litter. He is active, yet is becoming quite a lap kitty. He is looking forward to following in his mom's pawsteps as a show kitten. Go to his own page for more pictures and show accomplishments.